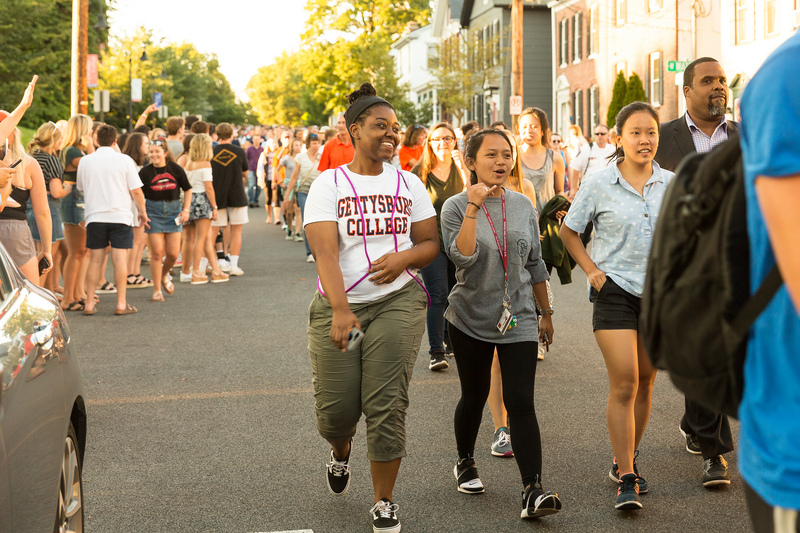 Dodging the Bullet: First-Year Walk | The Gettysburgian. Throughout our somewhat overwhelming orientation, the Class of 2022 has accomplished, experienced, and learned an awful lot. However, I think many students would agree that one of the highlights of the week has been our First-Year Walk. The First-Year Walk is a tradition started by a Gettysburg College student in 2003, when the first-year students recreated the journey made by Gettysburg College (then Pennsylvania College) students and community members to the Soldiers’ National Cemetery to hear Lincoln’s famous Gettysburg Address on November 19th, 1863. As the Class of 2022, we were able to witness – and participate in – the 16th year of this wonderful tradition. While we assembled in Christ Chapel to hear President Janet Morgan Riggs give a few remarks before the walk, the still air buzzed with excitement despite the heat. Many of our orientation leaders had talked about their own First-Year Walk and what it meant to them, which heightened the anticipation. We stepped out into the cool night air and lined up in the street, more or less organized, before the walk began. As we started on our journey, I had the privilege of walking beside President Riggs for a few minutes and chatting with her about how my orientation was going, which was a testifying experience to how genuine and friendly the faculty and administration are to our students. After that experience I was somewhat star-struck and took a few moments to realize the hundreds of people lining the streets, cheering us on as we began this symbolic journey and our Gettysburg College experience. Students, community members and families all smiled and waved and wished us luck as we passed by, making us feel welcomed and loved. We arrived at the National Cemetery about a mile later, and as we passed through the gates a respectful hush fell upon the crowd of students. After we assembled in the grass, we heard our National Anthem sung beautifully by Eby Busher ‘19. Bekah Hurwitz ’19, our Student Orientation Coordinator for this year, gave a few opening remarks to welcome us to this honored tradition. She introduced the Mayor of the Borough of Gettysburg, Honorable Ted Streeter, who presented a key to the city of Gettysburg to one of the Class of 2022, Diana Biesecker. President Riggs then took the podium to introduce our keynote speaker, Dr. Darrien Davenport. Davenport is the Executive Director of Multicultural Engagement and a beloved professor here on campus. After reciting Lincoln’s Gettysburg Address, which has gone down in history as perhaps one of the most profound speeches of all time, Davenport became emotional as he reminisced about when he began teaching here at Gettysburg two years ago. He recalled walking across campus shortly after he started here and seeing President Riggs, who gave him a huge warm hug. Then, he gave us a challenge. Following Davenport’s remarks, Bekah Hurwitz ’19 introduced the Playing of Taps, made possible by The Lincoln Fellowship of Pennsylvania and in partnership with Gettysburg National Military Park and Taps for Veterans. As the last haunting notes of the melody echoed across the cemetery, I got chills as I considered the endless opportunities to pursue in the next four years. This shared experience of the First-Year Walk was a moving tradition that brought the Class of 2022 closer together.